Today's image is a bit different but interesting I thought. We had some damage to electronic equipment about 2 weeks ago now. While out walking around in the yard last week I spotted my neighbor's tree looked odd. On investigation, it was obvious that it was hit by lightning. The left image is a panoramic taken with my phone and if you click and view large you can sort of see where it started way up in the tree. 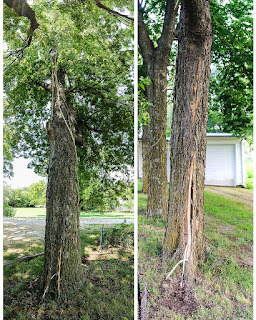 The image on the right shows how it came down the trunk on the other side as well and threw dirt out of the ground. It's pretty wild how it did that and tore strips out of the tree like that. Oddly enough, even though it's a lot closer to my neighbor's house, there was no apparent damage there but ours 30 to 40 yards away received some. Pretty odd and interesting how lightning works.